NEW YORK (CNN) -- At least nine protesters were arrested in a pro-Palestinian rally Sunday afternoon in New York that injured seven police officers, authorities said. Seven police officers were injured Sunday in New York City during a pro-Palestinian rally. 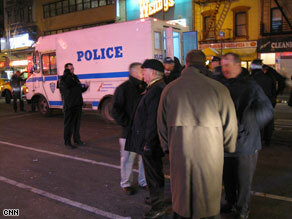 The extent of injuries varied from minor to serious, New York police said. Two officers sustained head injuries. Detective Cheryl Crispin said the protesters taken into custody faced charges ranging from disorderly conduct to reckless endangerment. In a statement, the NYPD said the officers were injured when trying to break up a fight between two demonstrators. "While attempting to separate the males, several others joined in and began to assault the officers," the statement said. Steve Sherman, coordinator of security for United for Peace and Justice and a demonstrator at the rally, said police maced demonstrators. "The police pushed us out onto the avenue, and as we were walking down the avenue ... they charged with horses on the sidewalks and they charged with their own bodies and pushed in, and a riot started," he said. Mike Eilenfeldt, another demonstrator, said confrontations between the police and protesters appeared to escalate after a police officer had fallen to the ground. "He's laying on the street, and from that point on it's a police riot where they start attacking the young people," Eilenfeldt told CNN. Police denied the allegations of mace being used on protesters.